This should be good news for diabetic’s subject to long-term, even lifelong, dietary restrictions aimed at controlling blood sugar and preventing diabetes-related complications, as medicalnewstoday.com puts it. A 2003 study in which participants were given one, three or six grams of cinnamon, or a placebo, on a daily basis showed that all three levels of cinnamon consumption produced decreased blood-sugar levels (as well as reduced “bad” cholesterol). Effects were still showing up in subjects 20 days later. Some caution is advisable, though. While cinnamon has shown potential in being useful for the treatment of blood sugar, other studies and research have been mixed, suggesting that cinnamon added to diets should not be considered a substitute for traditional medical treatment, to include use of prescriptions such as insulin, for diabetes. That said, many doctors reportedly are enthusiastic about cinnamon’s ability to help address some diabetes symptoms, such as when used as a nutritional supplement. Many of us know cinnamon mainly through our love of cinnamon-flavored breakfast cereals or those hot, gooey breakfast buns that offer fleeting sensations of nirvana. But cinnamon has an interesting history that dates back thousands of years. Its centuries-long use has been centered on medicinal use as well as for food preservation. 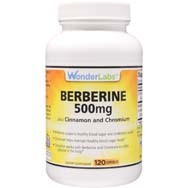 It is an aromatic spice that is harvested from the bark of Cinnamomum trees, per authoritynutrition.com. Once removed from the trees, the bark is dried – curling up in the process – and then processed into the powdered cinnamon we find in the form of spices shelved at the grocery store or placed into nutritional supplements, usually within capsules. Various types of cinnamon are sold in America, usually categorized as “ceylon” (what’s known as “true cinnamon,” the costlier kind) or “cassia” (less costly and more often found in food products). Cinnamon’s health benefits, especially as they relate to diabetes and blood sugar, aren’t magical; they are grounded in science. Nutritionally speaking, cinnamon offers little in the way of minerals or vitamins, but where it excels is in the provision of antioxidants. Quick review: antioxidants help diminish oxidative stress in our bodies – stress that results from cell damage caused by those pesky free radicals we’ve previously talked in this space. An oft-quoted study involving 500 milligrams of a cinnamon extract fed daily to prediabetic adult participants (who had impaired fasting glucose and were either obese or otherwise overweight, per National Institutes of Health [NIH]) for 12 weeks showed a reduction in oxidative stress of 14 percent. So, you might ask, what does oxidative stress have to do with diabetes? Presumably, plenty. Oxidative stress has been linked to the development of many chronic diseases, to include type 2 diabetes. NIH puts it this way: “Free radicals can lead to mutation and DNA damage that can be a predisposing factor for cancer and age-related diseases,” of which diabetes is one of those age-related diseases singled out by NIH. 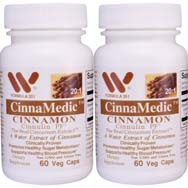 Per Mayo Clinic, several studies reviewed in 2012 agreed that cinnamon had a “potentially beneficial effect on glycemic control.” Among those studies was one published in 2009 in which subjects with poorly controlled type 2 diabetes fed a 500-milligram cinnamon capsule twice a day for 90 days experienced improved hemoglobin A1C levels – these are indicative of average blood-sugar levels for the preceding two to three months. Cinnamon has been shown to mimic insulin’s effects and enhance the ability of insulin to move blood sugar (glucose) into cells, per authoritynutrition.com. One small study, featuring seven male subjects, found that ingesting cinnamon boosted insulin sensitivity right after consumption and kept the sensitivity increased for another 12 hours. 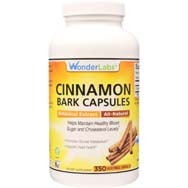 Cinnamon also might help tamp down blood-sugar spikes for someone immediately after he or she has eaten a meal. This likely is the result of cinnamon’s reducing the rate at which food empties out of our stomachs. Beware, though, too much consumption of cinnamon might not be good for you. Cassia cinnamon contains coumarin, an organic substance found in many plants that can be toxic to the liver. Also, a reminder: per Cleveland Clinic, citing the American Diabetes Association, cinnamon is not a replacement for traditional medical treatment when it comes to reducing blood-glucose levels. 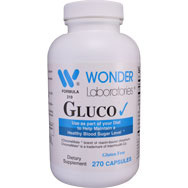 However, many health professionals say, it can be a healthy supplement. In either case, a discussion with your physician or a nutritionist is advisable before you add cinnamon to your daily regimen besides the coffee or oatmeal sprinkles.